Where to go for New Year’s Eve in Italy? Let’s start quickly our journey splitting up into two articles the huge amount of infos that revolve around this big event. Italians love to celebrate the ending of the old year and the beginning of the new year, meaning il Capodanno, a great time to be in Italy. La Festa di San Silvestro is on December 31, New Year’s Eve. Food plays an important role. Families and friends gather together for a huge meal. Lentils are the main character in this important play, bringing to whoever eats them money and good fortune for the coming year. The dinner includes a cotechino, that is a large spiced sausage, or a zampone, stuffed pig’s trotter, symbolising the richness of life for the coming year. Don’t forget to wear your red underwear to jump into the new year! It’ll bring you much luck in the coming year. Huge midnight fireworks displays welcome the coming of the new year. Most towns have public performances of pyrotechnic fire in a central square and private parties will include firecrackers or sparklers, too. Naples has for sure one of the best and loudest New Year’s fireworks displays in Italy. Many towns like Bologna build a bonfire in the central square where to meet friends into the early morning. Dancing and music before the fireworks are popular in the different piazzas: Rome, Milan, Bologna, Palermo and Naples put on huge outdoor shows with pop and rock bands. The New Year is also celebrated with rivers of spumante and prosecco, the most lovely Italian sparkling wine. New Years’ parties last until sunrise and are full of joy and craziness. An old habit, especially in the south, is that of throwing old things out the window around midnight! So please do not walk around or watch out of flying objects falling from the houses and balcony! Why Italians do this? To show to the world and to yourself that you are ready to accept the New Year. 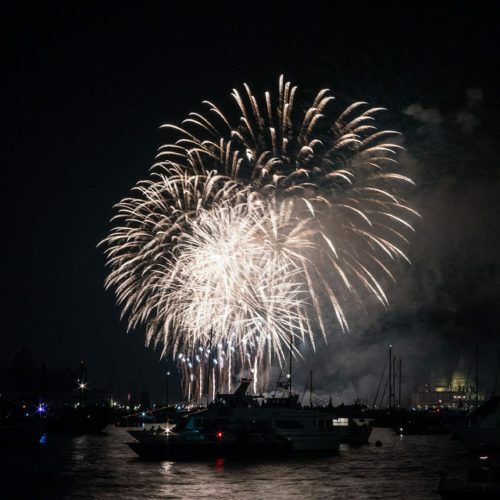 St Mark’s Square has an important celebration with music, an enormous fireworks display, bellini “brindisi”,a huge group kiss at midnight, which is also held in Piazza Ferretto, in Mestre. Many restaurants in Venice held a huge feasts on New Year’s Eve. Really expensive, with many courses and lots of wine, you need to make a reservation ahead of time. On New Year’s Day, Venice go crazy and many take a chilling turf in the waters of Venice’s Lido Beach. New Year’s Concert? Yes, grazie. The Concerto di Capodanno will be at La Fenice Theatre performed on December 30, December 31, and January 1. The December 31 performance (4pm), is followed by a huge New Year’s party starting at 8pm. A Venice Golden Opera New Year’s Eve concert are also held at the Scuola Grande dei Carmini at 7:30pm. Also Rimini holds a huge New Year’s Eve festival in Piazzale Fellini starting at 9:00pm and Bologna celebrates New Year’s Eve with the Fiera del Bue Grasso (“fat ox fair”). The ox is decorated from horns to tail with flowers and ribbons. Reminding an old pagan cult, but today completely christianized, the church bells rings, spectators lit up candles and fireworks are set off. A special lottery is held and the winner gets the ox. The holy procession on the other hand are on the way and it ends just before midnight in Piazza San Petronio, while in Piazza Maggiore there’s live music, performances, and a street market. At midnight a puppet resembling an old man is thrown into a bonfire. In Florence fireworks will be set off at midnight and you can see it from one of the bridges on the river Arno. Then one last thing to say: Buon anno!!!! This entry was posted on Monday, December 31st, 2012 at 12:57 am	and is filed under Events in Italy. You can follow any responses to this entry through the RSS 2.0 feed. You can leave a response, or trackback from your own site.